Angioplasty is a term describing a procedure used to widen vessels narrowed by stenoses or occlusions. There are various types of angioplasty. The specific names of these procedures are derived from the type of equipment used and the path of entry to the blood vessel. For example, percutaneous transluminal angioplasty (PTA) means that the vessel is entered through the skin (percutaneous) and that the catheter is moved into the blood vessel of interest through the same vessel or one that communicates with it (transluminal). In the case of an angioplasty involving the coronary arteries, the point of entry might be the femoral artery in the groin, with the catheter/guidewire system passed through the aorta to the heart and the origin of the coronary arteries at the base of the aorta just outside the aortic valve. An angioplasty is done to reopen a partially blocked blood vessel so that blood can flow through it again at a normal rate. In patients with an occlusive vascular disease such as atherosclerosis, the flow of blood to other organs or remote parts of the body is limited by the narrowing of the vessel's lumen due to fatty deposits or patches known as plaque. Once the vessel has been widened, an adequate blood flow is restored. The vessel may narrow again over time at the same location, however, and the procedure may need to be repeated. to angioplasty. Many medical centers, in fact, restrict the use of angioplasty to patients who cannot be treated with thrombolytic therapy. Angioplasties were originally performed by dilating the blood vessel with the introduction of larger and larger stiff catheters through the narrowed space. The complications that resulted from this approach led researchers to develop ways to open the vessel with smaller devices. As of 2003, the catheters used to perform angioplasties contain balloons that are inflated to widen the vessel, and stents (thin collapsed tubes made of wire mesh) to provide structural support for the vessel. Lasers may be used to help break up the plaque or fat deposits. Some catheters are equipped with spinning wires or drill tips to clean out the plaque. Angioplasty may be performed while the patient is sedated or anesthetized, depending on which vessels are involved. If a percutaneous transluminal coronary angioplasty (PTCA) is to be performed, the patient is sedated so that he or she can report discomfort and cough if asked to do so. PTCA procedures are performed in cardiac catheterization laboratories with sophisticated monitoring devices. If angioplasty is performed in the radiology department's angiographic suite, the patient may be sedated for the procedure while a nurse monitors the patient's vital signs . Angioplasties performed by vascular surgeons are done in an operating room or specially designed vascular procedure suite. Typically, patients are given anticoagulant (blood thinning) medications prior to the procedure to assist in the prevention of thromboses (blood clots), even though these drugs may slow down the sealing of the entry point into the vein. Patients may also be given calcium blockers and nitrates to reduce the risk of vascular spasm. The procedure is performed using fluoroscopic guidance and contrast media. Since the decision to perform angioplasty may have been made following a diagnostic angiogram, the patient's sensitivity to iodinated contrast media is likely to be known. The procedure may then require the use of non-ionic contrast agents. The patient's skin is cleansed with an antiseptic solution at the site where the surgeon will insert the catheter and other equipment, and the area is protected with a sterile drape. Although many angioplasties are performed by puncturing the vessel through the skin, others are done by surgically exposing the site of entry. Direct view of the vessel's puncture site aids in monitoring damage to the vessel or excessive bleeding at the site. After the vessel has been punctured and the guidewire introduced, a fluoroscope is used to monitor the small amounts of contrast media that have been injected. This technique allows the surgeon to see the guidewire's movement through the vessel. If the fluoroscope has a feature called "roadmap," the amount of contrast media injected is greater in order to define the full route the guidewire will take. The fluoroscopy system then superimposes subsequent images over the roadmap while the physician moves the guidewire along the roadmap to the destination. When the surgeon reaches the location of the stenosis, he or she inflates the balloon on the catheter that has been passed along the guidewire. The size of the balloon and the duration of its inflation depend on the size and location of the vessel. In some cases, the surgeon may also use a stent, which is opened or expanded inside the blood vessel after it has been guided to the proper location. The blood vessel may be widened before, during, or after the stent has been opened up. In cases where the vessel is tortuous (twisted) or at intersections of vessels, a graft may be necessary to strengthen the walls of the blood vessel. Stents, grafts, and balloon dilation may all be used together or separately. Sometimes radiation is used when a stent is placed. After the surgeon has widened the blood vessel, he or she verifies its patency by using fluoroscopy and contrast media to produce an angiogram, by using intravascular ultrasound, or by using both techniques. After the imaging studies have been completed, the surgeon removes the equipment from the blood vessel and closes the puncture site. There is a danger of puncturing the vessel with the guidewire during an angioplasty, although the risk is very small. Patients must be monitored for hematoma or hemorrhage at the puncture site. There is also a small risk of heart attack, stroke, and, although unlikely, death—all related to vessel spasm (transient vessel narrowing from irritation by the catheter), or from emboli (as plaque can be dislodged by the catheter or and travel to the heart or brain). 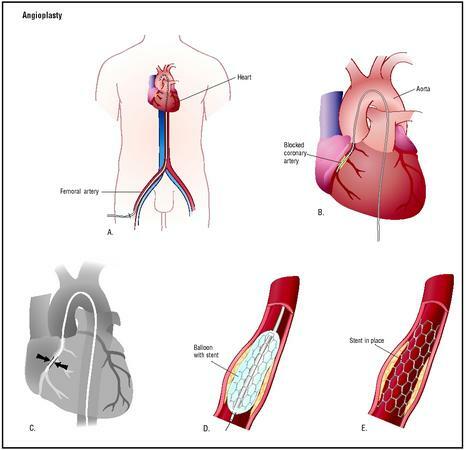 Abrupt closure of the coronary artery occurs in about 4% of patients. Recurrence of stenosis is an additional potential complication. The risk of recurrence is highest in the first six months after angioplasty, with rates as high as 35% reported in some studies. The length of the patient's hospital stay following an angioplasty depends on his or her overall condition, the occurrence of complications, and the availability of home care . Physicians often have specially trained assistants for vascular procedures. These assistants may be nurses, surgical technicians, or x ray specialists. Cardiac catheterization laboratories will include someone specially trained in monitoring EKG equipment and vital signs. Either a nurse, nurse anesthetist, or anesthesiologist will administer sedation or anesthesia for the procedure. "Diagnostic Cardiovascular Procedures: Invasive Procedures." Section 16, Chapter 198 in The Merck Manual of Diagnosis and Therapy , edited by Mark H. Beers, MD, and Robert Berkow, MD. Whitehouse Station, NJ: Merck Research Laboratories, 1999. Schneider, Peter A. Endovascular Skills: Guidewires, Catheters, Arteriography, Balloon Angioplasty, Stents . St. Louis, MO: Quality Medical Publishing, Inc., 1998. Carnall, Douglas. "Angioplasty." Western Journal of Medicine 173 (September 2000): 201. "New Imaging Technique Could Improve Outcome of Popular Heart Procedure." Heart Disease Weekly (May 13, 2001): 3. Schiele, F. "The 'Angioplastically Correct' Follow Up Strategy After Stent Implantation." Heart 85 (April, 2001): 363-364. "Success Clearing Clogged Arteries." Science News 159 (February 3, 2001): 72. American Heart Association. Heart & Stroke Guide: Laser Angioplasty. [cited July 5, 2001]. http://www.americanheart.org/Heart_and_Stroke_A_Z_Guide/angiol.html . MayoClinic.com . Coronary Angioplasty: Opening Clogged Arteries . [cited July 5, 2001]. http://www.mayoclinic.com . Miami Heart Research Institute. Cardiovascular System , 2001. [cited July 5, 2001]. http://www.miamiheartresearch.org/LearningCenter/YourCardiovascular../Cardiovascular.htm . Elaine R. Proseus MBA/TM, BSRT, RT(R) Lee A. Shratter, M.D. my doctor wants to do the procedure first to see if I will need a stint, which he will do at a later time if necessary. Wondering why he wouldn't just plan on the stint procedure first. I want to know that is there any risk in angioplasty to tear the wall of the blood vessel by catheter or by any means? HELPES IN FUTURE SO PLS REFER AS A GOOD SOURCE. Hello sir! !my name is neha my father suffered frm angina pain.he went through the ngography n after this it is cleared that his all 3 cad is blocked with high percent.so plz tel me about the type of stent in ngoplasty surgery?life of stent?n which one of them is best for my father.he is 65 years old.plz rply me on my mail id as soon as possible. My friend has undergone 3rd angiography in the past 8 days. He had a brain haemorrhage. How many times can angiography be performed on the patient? I do understand his condition is very critical and the doctors are doing their best to save him. My friend has coronary artery disease, has a lot of plaque on his artery, Doctor wants to do angioplasty to break up the calcium , but the risks are not good, if he does nothing he may live 9 months to a year. If he has procedure, the calcium can break up and go strait to his brain? Stroke or could be instant death. Doctor does not explain things very well or return phone calls. He is on an HMO, can he ask for a 2nd opinion? Waiting for my procedure are there any alternatives and what aware risk. I am 64.